Rice pudding can be made with white, brown, or even wild rice, but it’s the short-grained variety that releases its starch, creating a thick, creamy texture. 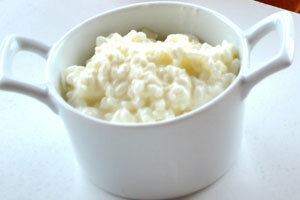 Pudding could be made simply using leftover rice from dinner, simmered with milk or cream and sweetened with sugar or honey – but here’s a classic diner-style rice pudding if you want to start from scratch. 1. In a medium saucepan, bring the rice and 1 1/2 cups of water to a boil. Reduce the heat to low, cover and cook for 20 minutes. Remove the lid and stir in half the milk, sugar and salt; cook, stirring, until the mixture is thick and most of the liquid has been absorbed. 2. Add the rest of the milk and the egg and bring to a simmer, cooking until the mixture is thick and creamy. Remove from the heat and stir in the vanilla and raisins, if you’re using them. 3. Cool completely and serve in individual cups or glasses. 123 calories, 2.3 g fat (1.3 g saturated, 0.8 g monounsaturated, 0.2 g polyunsaturated), 37 mg cholesterol, 20.7 g carbohydrate, 4.3 g protein, 0.1 g fibre.